Imagine eating a piece of fish and subsequently losing the ability to tell the difference between hot and cold. This one piece of fish could also cause nausea, vomiting and possibly 170 other symptoms that are the result of an algae toxin, known as ciguatoxin. The resulting illness, ciguatera fish poisoning, causes problems for thousands of people each year, and a Florida Gulf Coast University researcher and his team are working to help identify afflicted fish before they’re caught. FGCU marine science professor Michael Parsons is the principal investigator on a $5.9 million grant project funded by the National Science Foundation and the National Institute of Environmental Health Sciences, which is one of the National Institutes of Health. “Ciguatera is a toxin similar to red tide, but it’s more potent. It’s true that ciguatera is not as well-known as other harmful algae, but that’s unfortunate because it is the main source of seafood illness that’s not caused by spoilage,” said Parsons, director of FGCU’s Coastal Watershed Institute and Vester Marine and Environmental Science Research Field Station. Ciguatoxin has caused problems for people all over the globe for centuries. In the last three years, poisonings were reported in multiple European countries and provinces, such as Bermuda, and American locales like Hawaii and Saipan. Parsons said more than 50,000 people per year contract ciguatera fish poisoning. “We know what the causative organism is. It lives on algae – seaweed. What we don’t know is when organisms go and eat the seaweed or eat these little algae – almost like eating the sprinkles off a doughnut – we aren’t sure which one is the primary source. There are lots of different kinds of seaweed on a coral reef, so which ones are the source that allows ciguatera to thrive? We plan to collect hogfish from different areas and look at their diet over time. That will help us see if we can track the toxin from the algal source through the different organisms that a hogfish eats,” said Parsons, who has previously led grant-funded ciguatera projects. 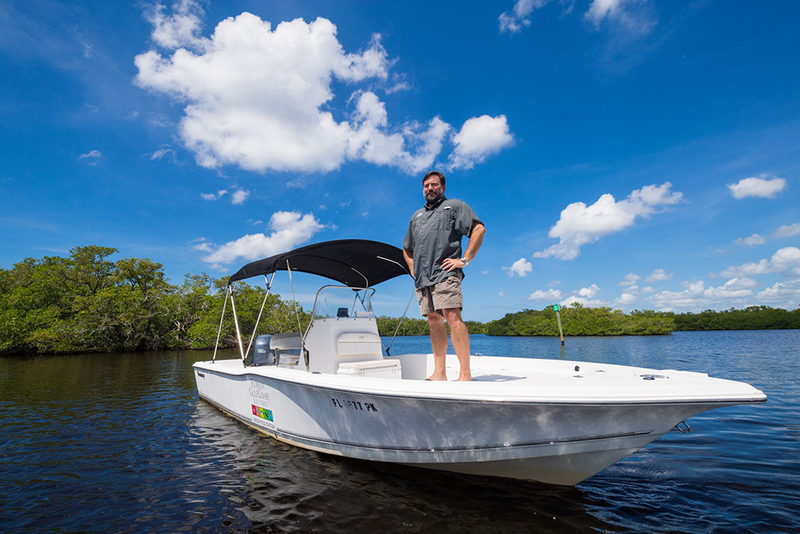 Mike Parsons is the director of Florida Gulf Coast University’s Coastal Watershed Institute and Vester Marine and Environmental Science Research Field Station. In addition to hogfish, barracuda, snapper and grouper, other fish are known to have poisoned people. Nevertheless, Parsons believes the bigger problems are the location and the types of algae certain fish ingest. With that understanding, he hopes the five-year project will also help him create forecasting abilities that can help the fishing industry avoid capturing fish populations that are likely infected. “We have a working model right now, and the next step would be to use it to say there is a greater chance of getting ciguatera if you eat fish caught in this location. We have to partner with the local fishery managers and commercial fishers on how to work with those advisories. We don’t want to scare the public. We need to make sure the commercial fishers are fully on board. We rely on the fishers to help us identify initial areas that likely have fish that contain ciguatoxin,” said Parsons, a former member of the National Harmful Algal Bloom Committee. The grant funds the Greater Caribbean Center for Ciguatera Research at FGCU. In addition to Parsons, the team includes researchers from the University of South Alabama, Mitchell Cancer Institute, Dauphin Island Sea Lab, University of Texas Marine Science Institute, Woods Hole Oceanographic Institute and the University of the Virgin Islands. “Everyone has a role. My job is to take all the information that comes in from these different groups and create an overview of what’s going on. I think my advantage is that I can review the data and put the findings into context with everything else that’s going on,” Parsons added. Parsons said, regardless of the findings, he focuses on determining the best way to use his research for the betterment of society. He seeks to understand specific problems better, safeguard fisheries and help prevent illness. “I think scientific communication as a whole is very important. Findings need to be put into context. We need the support of everybody because we depend on taxpayer money for our funding. We need to make sure everyone understands what we’re doing. We need to make sure we can translate it, so nonscientists see why our findings are important. We’re hired by society to do this work, and I think we need to remember that,” Parsons concluded. Part of the grant includes community outreach. Parsons and his research team plan to hold information sessions for communities at higher risk for ciguatera.